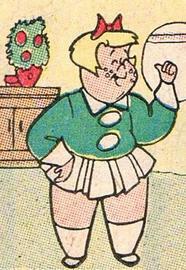 Little Lotta is a fictional character published by Harvey Comics from 1953 to 1972, and then sporadically until 1993. A contemporary of Little Audrey, Little Dot, and Wendy the Good Little Witch, she was one of Harvey's best-known female characters during the 1960s and featured in many of the company's child-friendly comedy titles. Like many of Harvey's comic headliners, Lotta was notable for a 'quirky' defining characteristic - in this case, an insatiable appetite giving rise to superhuman strength.